Now that we’re in the middle of the post-New Year gym rush, we’ve been taking the time to assess both our health and fitness goals. Whether we’re committing to working out five times a week or we plan on totally revamping our diets, there’s no time like the first few weeks of January to take a step back and truly evaluate where we’re at health-wise. One of the best ways to do just that — besides signing up for a class we’ve never taken before or cutting out the stuff in our diets that makes us sluggish, uncomfortable, or just not feel all that great? Hitting the reset button and opting for a juice cleanse! Even if our path to “new year, new me” didn’t quite quick off yet, a juice cleanse is a great first step to take to kick off the journey. It acts as a clean slate and wipes away the evidence of junk food and other unhealthy items. Whether we have a big party coming up, a birthday, a wedding or just want to eradicate any traces of a weekend spent indulging a little too much, there are plenty of juice cleanses designed to fit any lifestyle and frequency. See it! 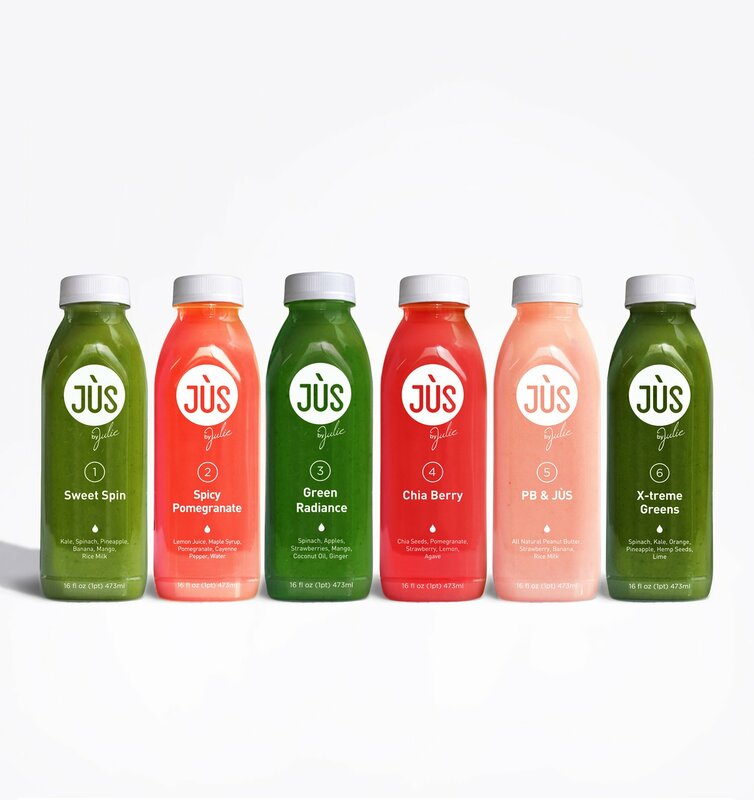 Get the JÙS by Julie JUS Cleanse for 30% off sitewide and free shipping with promo code FREESHIP30 through March 31! 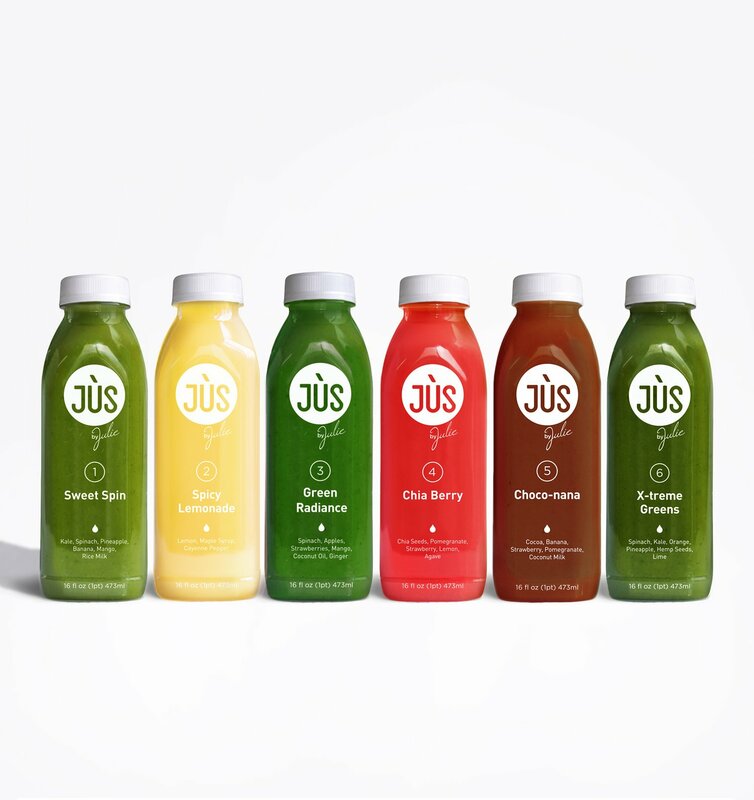 There are a ton of cleanses on the market, though one of the ones we always come back to are the ones from JÙS by Julie. What makes each cleanse so special? Instead of cold-pressing the juices (like many competitors do) each juice is blended to ensure each serving has 100 percent of the fruits and veggies we’re enjoying. In short, that translates to plenty of antioxidants, fiber and live enzymes, which in turn play a role in flushing and absorbing toxins and giving us the fuel we need to operate to our fullest potential. Each cleanse is also designed to decrease the want and need for snacks, plus give a new sense of energy. Good vibes all around! There are five cleanses in total, all made to accommodate any lifestyle. For starters, there’s a one day cleanse, a two-day, a three-day and a five-day cleanse, perfect for both dipping our toes into cleansing or for a full week’s worth of detox. The assortment of juice choices is the same, regardless of the length of the cleanse we’re opting for! First, all cleanses include Sweet Spin, which is jam-packed with vitamins A and C and has kale and spinach, plus pineapple, banana and mango for a jolt of sweetness. Next, there’s spicy lemon and spicy pomegranate, which employ cayenne pepper for a little kick to the juice. Green juice fans, don’t worry: There is a Green Radiance and X-Treme Greens juice too! Green Radiance brings a tropical spin on a traditional green drink, with apples, strawberries, mangoes and coconut oil to balance out the spinach. X-Treme Greens has a deeper flavor than Sweet Spin and has orange and pineapple to sweeten the spinach and kale, plus protein from hemp seeds. Plan on working out during the cleanse? Chia Berry is a great pick to keep in a gym bag to sip on post-sweat session. Plus, it’s just wildly delicious, with blended chia seeds, pomegranate, strawberry and lemon, plus agave for a bit of extra sweetness. For a truly delectable treat, each cleanse also comes with a Choco-nana, Watermelon Wizard or a PB and JUS cleanse! Choco-nana has cocoa, banana, strawberry, pomegranate and coconut milk (a must for those with a sweet tooth!) Watermelon Wizard contains watermelon, pineapple, strawberries, lemon juice, Maqui Berry powder and rosemary, perfect for a hydrating kick! PB & Jus has a simple (but delicious) blend of peanut butter, strawberry and banana, plus rice milk, perfect for a spin on a classic PB&J. For those who prefer to have a solid and healthy dinner (or point-blank, just have dinner plans), the 5-Day cleanse also comes with juices from breakfast until the last meal of our day! It’s a great way to dip our toes into cleansing, as well as any athletes performing high-intensity exercise. Instead of six different juices, we’ll have four — Sweet Spin, Spicy Lemonade/Spicy Pomegranate, Green Radiance and Chia Berry or Berry Blend. Don’t worry: Each juice comes numbered, so there’s no confusion about which to take when. Don’t dig any of the pre-made cleanses? We can curate our own lineups, too! Create a custom bundle of cleanses by selecting which sound yummiest! It’s a pre-set price of $35, so just add away! The best part? Reviewers insist these cleanses are the most delicious they’ve tried! Many call them “yummy” even those that were initially scared to try a juice cleanse! They even say they’re not too hungry when trying these! Editor’s Note: This article was updated on March 26, 2019 to reflect the new offer.